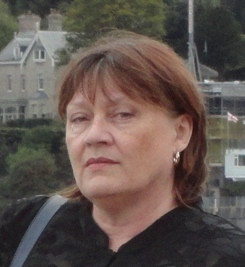 In September 2010 an old lady was found dead in her flat in Torquay. Her neighbours thought her a recluse and had called her the cat lady because her only companion was a ginger cat. When her flat was searched for the addresses of any family or friends, the 89 year old woman's true identity was discovered. Her name was Eileen Nearne and, in 1944, she had flown into German-occupied France as a wireless operator for the Special Operations Executive, attached to a circuit in the south of Paris. Further investigation revealed that she had been captured and incarcerated in Ravensbrück Concentration camp. So many people who found themselves in concentration camps did not survive but Eileen Nearne not only survived, she managed to escape from a work party, eventually meeting up with the advancing Americans in the spring of 1945. 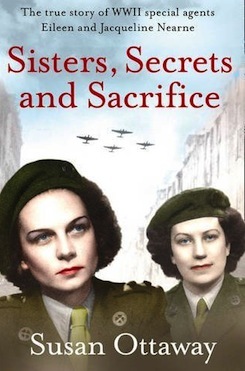 Sisters, Secrets and Sacrifice tells the story of Eileen Nearne's war and that of her elder sister, Jacqueline, who was also an SOE agent and worked for a very large circuit for 15 months before being brought back to England suffering from exhaustion. Both women had remarkable, although quite different, experiences during the Second World War which affected them for the rest of their lives. As Eileen once said, she missed the danger and excitement of her time as an agent in Paris and, despite the horrors of her imprisonment, everything that followed was very tame by comparison. "This is an absorbing, historically valuable account of Jacqueline and Eileen Nearne’s war service. With the help of their niece, Odile, who provided family papers and photographs; assisted by interviews with Eileen herself from 2001, Susan Ottaway has brought the sisters’ personalities vividly to life. Mastering difficult primary and secondary source material with humanity and warmth, her narrative introduces important corroborative insights into SOE with clear glimpses of some leading individuals; into the kind of lives British and French agents led and the price most were prepared to pay for their clandestine actions in France. Amidst a plethora of volumes by and about World War II secret agents and their organisations, Susan Ottaway’s book surely occupies a special niche." "An incredible, inspiring story….Eileen Nearne was one of the bravest secret agents of World War II." "A remarkable and haunting book." "A life of incredible heroism and courage." "Susan Ottaway skillfully unravels a gripping and suspenseful tale of one family’s personal sacrifice, courage, and commitment to serve their country and the cost to them to do so." " Seven decades later, remarkable tales from World War II continue to be discovered. The story of the Nearne sisters is certainly one of them. Their extraordinary experiences from young schoolgirls to British Intelligence agents working behind enemy lines as couriers, saboteurs, and wireless operators are remarkable, and when you read about one sister who was captured, tortured and escaped from the Ravensbruck Concentration Camp, you wonder why it has taken so long for us to learn about these women. Thanks to Susan Ottaway, they will are back in our lives. And thank you to Jacqueline and Didi Nearne. We should all possess your courage, tenacity and loyalty." Elizabeth M. Norman, author We Band of Angels: The Untold Story of American Women Trapped on Bataan by the Japanese. "This is a book with great depth, not only a deeply felt account of two remarkable sisters, whose courage and contribution continue to inspire, but also an honest critique of the all too fallible system and people behind the agents. Fascinating, appalling and inspiring." "An incredible story of sisterly love and courage in the face of absolute evil." "With vivid color and remarkable detail, Susan Ottaway has written a gripping and magnificent tribute to two courageous young women who braved torture and death from the Gestapo to carry out important Allied undercover work in German-occupied France." "A powerful story. A Cool and Lonely Courage reminds us of the staggering courage displayed by men and women clandestinely deployed in France during World War II in the fight to save freedom and the Western world. The Nearne sisters, SOE agents born in England and raised in France, risked all to serve the Resistance, played vital roles in foiling the Nazis, and deserve a special place in our hearts and lore." " Susan Ottaway has written a true-life spy thriller, an extraordinary story of danger and survival set in war-time occupied France. Ottaway's colorful tale of spycraft is reminiscent of Ben Macintyre's Operation Mincemeat--or Eric Ambler's classic spy novels. But drawing on newly declassified records from the British archives, Ottaway gracefully documents the uncommon courage of the Nearne sisters and unearths an important and untold chapter in the history of British espionage operations in World War II. " Kai Bird is a Pulitzer Prize-winning biographer and author of The Good Spy: The Life and Death of Robert Ames. "Ottaway is a gifted storyteller, rarely losing momentum and skillfully weaving family strife, SOE bureaucratic problems and on-the-ground Resistance work into a cohesive narrative. She draws attention to issues within the SOE administration but also goes to great lengths to show how their agents fought tirelessly for the cause. The author does not provide much background on the war, leaving some readers out of the loop on certain points, but even this snag won't lessen enjoyment of the book. A compelling story sure to please history buffs and novices alike." "Ottaway is a gifted storyteller, rarely losing momentum and skillfully weaving family strife, SOE bureaucratic problems and on-the-ground Resistance work into a cohesive narrative. She draws attention to issues within the SOE administration but also goes to great lengths to show how their agents fought tirelessly for the cause. The author does not provide much background on the war, leaving some readers out of the loop on certain points, but even this snag won't lessen enjoyment of the book. A compelling story sure to please history buffs and novices alike. " "I love untold stories and this is a compelling one! Susan Ottaway skillfully transports the reader into the shadowy cloak and dagger world of occupied France and allows them to experience the daring exploits of a sisterhood of spies. I highly recommend A Cool and Lonely Courage." "A wonderfully told story of two extraordinary sisters, operating behind enemy lines, whose cool and lonely courage helped defeat Hitler." "Ottaway recounts the harrowing true story of Eileen Nearne, and her sister, Jacqueline… Her riveting account details the risk they took, the friends and colleagues they lost, and their family’s fate during the war." "Ottaway recounts the harrowing true story of Eileen Nearne, and her sister, Jacqueline…. [Her] riveting account details the risk they took, the friends and colleagues they lost, and their family’s fate during the war."